The phrase "best film of 2012" is being bandied about regarding the new Leos Carax movie HOLY MOTORS, but I would take a step back before jumping on that particular bandwagon. The movie is certainly fun (for awhile), deals in weighty themes (among these: class, religion, the utter arbitrariness of life, the ordeal of the filmmaker and his audience), and gives one of cinema's most spectacular performers -- Denis Lavant -- the chance to strut his stuff as eleven different characters (one with a hard-on that just won't quit), all residing under the same actor's roof. 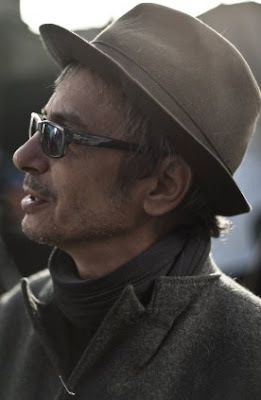 As writer and director, Carax, shown at right, goes on too long (as usual: Bad Blood, The Lovers on the Bridge, Pola X), yet much of what he shows us is at least interesting, sometimes riveting, and often original. Original, however, does not always signify worthwhile, and Carax alternates between the unusual and the pretentious, the pompous and the playful. Unfortunately, "playful," in this filmmaker's hands is rather like having a game of soccer while using a 30-pound lead balloon as your ball. Heavy, man. i'm looking forward to this when it comes to film forum! Thanks for the comment, MrJeffrey. I had forgotten that the film was also opening at Film Forum, so thanks for the reminder.